Book Description A totally unique approach to providing all the information the experienced computer user needs. Detailed information, shortcuts and tips are presented in a clear and accessible way ' a new reference guide is an essential addition to a bookshelf. Double Index Exclusive to the New Reference series, this invaluable double index can be used to quickly and easily find practical or theoretical examples to any keyword or query. Designed to make the books even more user friendly, this is one feature that will be appreciated greatly. Part 1: ReferenceProvides all the essential commands and functions. It also provides a theoretical overview broken down into logical categories. Part 2: PracticeOffers practical advice, and real world examples placed into a real world environment the reader will be comfortable with. The "New Reference" series is a unique approach to providing all the information the experienced computer user needs. Detailed information, shortcuts and tips are presented in a clear and accessible way. The "Double Index" is exclusive to the New Reference series, and can be used to quickly and easily find practical or theoretical examples to any keyword or query. Designed to make the books even more user friendly, this is one feature that should be appreciated greatly. 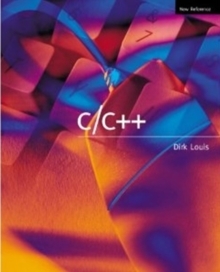 Part 1 provides all the essential commands and functions of C/C++. It also provides a theoretical overview broken down into logical categories. Part 2 offers practical advice, and real world examples placed into a real world environment the reader will be comfortable with.